Contract work blurs the traditional definitions and roles of employee and employer, and this evolution of the labor market has created tension between contract law and employment law. The New Jersey Supreme Court has taken up a case that arises out of that evolution. It is deciding whether contract employees can be required to waive tort claims they might bring against a contract employer when Workers Compensation is available from their direct employer. We filed an amicus brief in this case arguing that making the Workers’ Comp model compatible with the modern economy requires that such arrangements be upheld. Chances are good that you or someone you know works a non-traditional job. Businesses are increasingly focusing on their core competencies and bringing in outside people for unrelated or temporary tasks. In Vitale v. Schering-Plough, the pharmaceutical company Schering-Plough contracted some of its security positions out to Allied Barton Security Services, who hired plaintiff Philip Vitale as a guard. The plaintiff’s contract with Allied Barton included a provision that waived his right to bring tort claims against any of Allied Barton’s customers for work injuries covered by Workers’ Compensation – a common provision in third party contracts because of how the Workers’ Compensation system works. The Workers’ Compensation system provides swift relief to employees who are injured on the job. Employees give up the right to pursue tort claims in exchange for the certainty of prompt compensation without the burden of establishing fault. Employers fund the system, and gain the benefit of limited liability. Either party can opt out of the system, but few choose to do so. As contract work has become more common, new contractual arrangements have become necessary to make this mutually beneficial system work in the context of third-party contracting. Host companies would lose the benefit of the Workers’ Compensation bargain if the company they hired was participating in the Workers’ Comp system, and passing those expenses on to the host company, but the host company was still at risk of being sued under tort law. The solution is to limit an employee’s ability to sue a host company if their work injuries are covered by Workers’ Compensation. Restoring the balance between the parties in this way puts the employee and the host company in the positions they would be in if the employee were working directly for the host company. The plaintiff in this case, Vitale, tripped on bag of ice melt, got the Workers’ Compensation benefits he was eligible for under his contract with his employer, Allied Barton, then filed a lawsuit against his host company, Schering-Plough. If he worked directly for Schering-Plough, he would not be able to bring a case. But because he worked for Allied Barton, who paid for the Workers’ Compensation insurance that covered his injuries, he sued his host company, Schering-Plough, claiming that his waiver of tort claims against them was unconscionable. The New Jersey Supreme Court must now decide whether to allow the plaintiff’s suit against Schering-Plough to go forward, or to uphold the contracts Allied Barton has with the plaintiff and with Schering-Plough. Court has a choice to make. At oral argument, the Court seemed troubled by the idea that the plaintiff was giving up potential tort claims, and maybe even intrigued by the idea of reversing the trend towards third-party contracting – perhaps losing sight of the significant value of the Workers’ Comp scheme itself, and how destabilizing an adverse decision would be to that system. The Court’s decision in this case is unlikely to reverse the nationwide trend towards third party contracting. But how they resolve the question of whether tort claims can effectively be waived might well determine whether the Workers’ Comp model can continue to function in the modern economy. If having a strong Workers’ Compensation system is good public policy, incentivizing third-party employers to opt out surely is not. If an employee cannot sign a binding waiver of tort claims against his host company for injuries covered by Workers’ Comp, then those companies will demand indemnification agreements from the contractors to cover their liability exposure. At that point, the direct employer of an injured employee will be paying the very tort claims that Workers’ Comp was intended to limit, and that end-run around Workers’ Comp eliminates the incentive to participate. Plaintiffs understandably like the idea of an “all of the above” option: retain the certainty and reliability of Workers’ Comp and also gain the ability to roll the dice and wait the years it takes to secure a verdict in the tort system. We trust the Court will not take the Workers’ Comp scheme for granted, but will closely consider how changes in the incentive structure would affect the availability of this important safety net for future third-party contractor employees. Notably, all other states that have considered the question have upheld the contractual waivers. Oral arguments in this case were held on September 26, 2017, so it may be a few months before the court issues an opinion. We will provide an update when the decision comes down. In the meantime, if you have any questions or comments about this or other cases of interest, please contact NJCJI President & Chief Counsel Alida Kass. 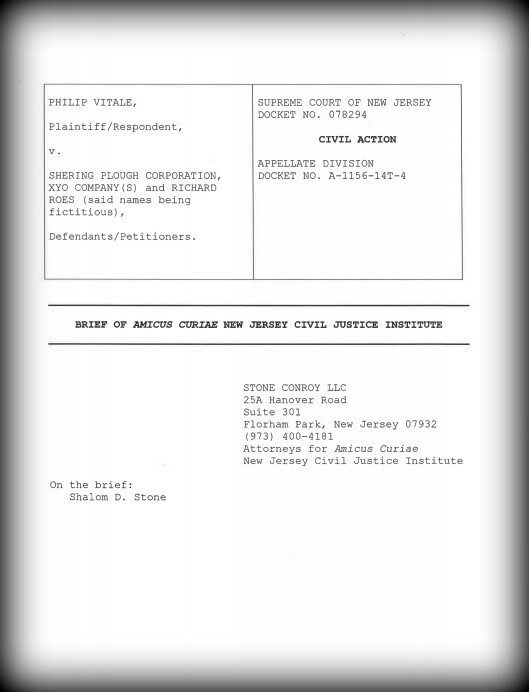 Thank you to Shalom Stone of Stone Conroy, LLC who authored the New Jersey Civil Justice Institute’s brief in this case.